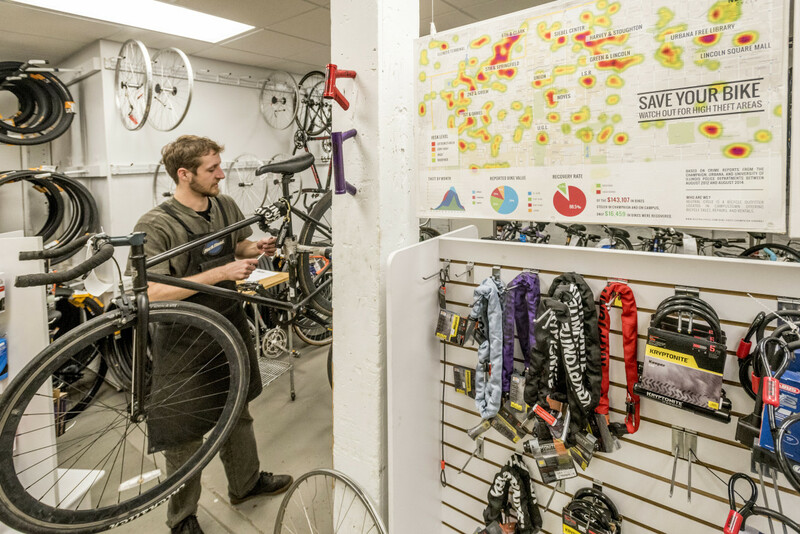 Matt Crosby, manager of Neutral Cycles, works on a bike by the map of bike thefts in the shop on campus in Champaign on Monday, March 28, 2016. If a bike is stolen from a University of Illinois student on the Urbana-Champaign campus, there is little chance the bike will be recovered. In fact, 95 bikes worth about $27,000 in total were reported stolen in 2015 and only 16 — about $3,600 worth — were recovered, according to university police. Flyer asking for information on a stolen bike in Champaign-Urbana. Those figures mirror numbers for each year since 2013. University police figures show that a total of 274 bikes worth about $78,500 in total were reported stolen over the past three years. Of them, 216 bikes worth about $68,000 in total were not recovered. As of late February 2016, 11 bikes worth about $3,800 in total were reported stolen before warm weather has arrived. Only one bike worth $100 has been recovered. Law enforcement officials emphasized that these are only reported thefts. They said many times bike thefts are not reported. Brown said “95 percent of the time” victims of bike theft don’t have the necessary information about their bike to help police track it down. This includes not only having the serial number but registering the bike with police and sharing the bike’s identifying characteristics. “It’s a very difficult crime to catch someone, unless we catch them in the act or the victim actually sees someone on their bikes,” said Lieutenant Robert Rea, who has been supervisor for the Champaign Police Department since 2005 and reviews bike theft reports. Local business works on app on bike use and theftsUniversity student Anwen Parrott said in an interview her bike was stolen in 2014 but she did not report the crime.“I thought that action would have been pretty futile.” Parrott said, noting she never registered the bike because she didn’t know she was supposed to. “It’s pretty easy (to steal a bike and get away with it),” said Miles Thomas, a founder of the Champaign-Urbana bicycle shop Neutral Cycle.The shop helps educate bicyclists, repairs bikes and started issues bike rentals through a program started in fall 2014.Thomas, who is a University graduate student in urban planning, has taken on another project over the past few months: creating an app to help prevent bicycle theft. The developing app, which has temporarily been named “Save the Bike,” will allow owners to register their bikes on their phone and report bike theft. A number of people have posted on the University of Illinois-centric Free & For Sale Facebook page since the start of the school year, looking to buy a bike to replace one that had been stolen. Lt. Rea said sometimes police will recover a bike originally stolen from campus abandoned somewhere off campus – his assumption is that someone steals the bike for a one-time use to get from one place to another. Currently 2,245 bikes are registered in the University of Illinois’ identification system, which dates back to 2012. But some bikes in the system could no longer be on campus or in use, officials say. There could be as many as 8,000 bikes currently on campus, University Transportation Demand Management Coordinator Stacey DeLorenzo said. But Miles Thomas, a founder of the Champaign-Urbana bicycle shop Neutral Cycle, said there’s no way of knowing the real number. Neutral Cycle provides online information about bike crimes and maps them. The map shows that most theft occurs at campus locations such as the Seibel Center and the Illini Union where many bikes are parked together. Brown said the University Police Department’s biggest education initiative occurs during freshman orientations. Officers tell students and their parents to register their bikes and talk about the possibility of theft on campus. But Kevin Stillwell, a staff writer and editor for Neutral Cycle’s website, said he believes the University can improve on educating students about bicycle theft. University Police Lieutenant John Brown with a couple of the recovered bikes at the University of Illinois police evidence storage. The biggest catalyst of campus bike theft, Stillwell said, is students not properly locking their bikes, a topic he researched in 2014 for Neutral Cycle. His research found 52 percent of bikes parked at dorms were locked with cables locks – a type of lock Stillwell has said is easy to cut through and remove — while 47 percent used cable locks on the quad.